The Copa America has been another great opportunity to observe how chavismo, or at least its higher exponents, think that country belongs to them to do as they please. During the Saturday game where Mexico won the third place of the Copa America, there was a strange incident in the benches. The mayor at large of Caracas, Juan Barreto, was attending the game, his right certainly, For some reason he got into a scuffle with one of the people also attending the game, Marco Carillo, a faculty at the Catholic University. It is not clear why the scuffle started except that Barreto decided that he wanted to get the baseball cap that Carillo wore. This all in the middle of the crowd watching the game, in front of someone holding his child in his arms. Now, whatever happened, someone holding a video camera filmed the whole scene and we can clearly see the different steps of the scuffle. 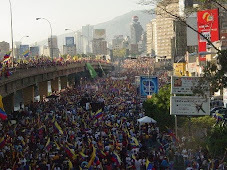 Globovision showed everything, picture by picture, there is not much doubt possible. Barreto lounges ahead. Barreto tries to grab the cap. Carillo stands backs and is forced against the handlebar. The military police arrives and tries to pull Barreto away. Barreto "crowd" arrives to help Barreto and attacks Carillo (the mayor said later they were "not his body guards, just sympathizers that support my management of the city", or something like that; I kid you not). One of the "friends" of Barreto hits Carillo as the Military police tries to stop everything. Another group of three "sympathizers" climbs on the outside of the handlebar to attack Carillo, one of them is seen having a gun on his belt, something hat was absolutely forbidden in the stadium or the grounds of the UCV campus where the stadium is located. And to top it off, the police of Barreto, la Metropolitana, tries to expel Carillo of the stadium but the crowd and the Military Police block their action. Astounding! Barreto broke enough rules Saturday to be impeached fast by any serious municipal council. At the very least Barreto should be investigated. Yet, nothing will happen even though Barreto has been shown as the liar and violent he is, something that has been evidenced many times in his past and troubled/ing life. But perhaps the very best is that he said more or less that it was thank to his actions that the stadium was renovated and that the people should be grateful. As if it were from his pocket money and not from tax payer money; as if it were not his duty to maintain sports installation in the city; as if his actions had been that good since the delays cost Caracas to lose one of the originally games scheduled to take place in Caracas. The psychotic dissociation of Barreto and his all out violence are truly deserving of investigation before he comes to kill someone with his own hands. Barreto is dangerous. Miguel reported on another "scuffle" that happened OUTSIDE of the stadium. Some students were passing fliers, something that happens in any stadium with any big game in any civilized country of the world. Well, they were arrested, got freed only because of public outrage and now are subjected to a judicial regime where they must present themselves to some tribunal every week. They also got a warning as not doing anymore what they were doing. This way we can assume that a new judicial "precedent" has been established and thus giving fliers at a stadium door might become a major crime. So, these 4 kids, giving fliers met justice but Barreto who actually broke real laws might be steaming but does so in total freedom. Besides, while an uncounted number of "security personnel" was used to arrest four dangerous students I am pretty sure that within a 2 miles radius of the place people were robbed, were murdered. How many people did die in Caracas of violent murder the last week end? 10? 20? As much as an average Iraq car bomb? 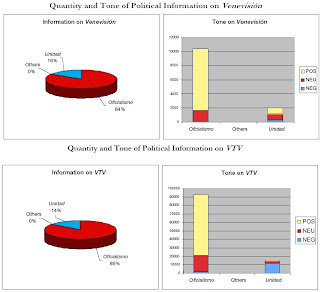 But of course chavismo higher luminaries do not worry about crime. They are either robbing themselves public moneys or are accompanied by thugs, ooops!, I mean bodyguards everywhere like Barreto. He was with at least 4 "sympathizers", one of them at least with a gun. By the way, the students were charged with "incitation to hatred". Barreto showed true hatred. But I suppose that practicing hate is not a crime in the bolivarian revolution; inciting it, yes. 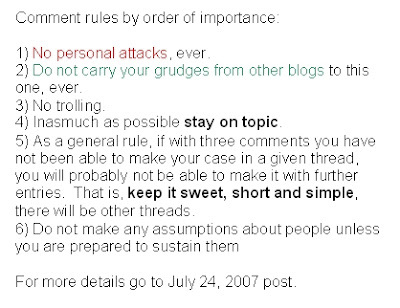 I suppose that if you are stupid enough to incite hate while not practicing it, then you deserve to be punished. Sometime in the bolibanana revolution truth is stranger than fiction. 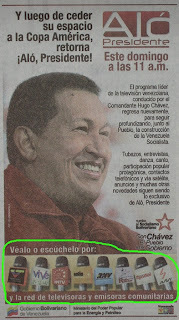 The ad on the right was published today in El Nacional. It is a half page ad, vertical. And it promotes some kind of frequent flier plan. However, something is not quite right. But first let's present CONVIASA, the airline of the Venezuelan government. The excuse for Conviasa was that it would promote popular tourism. That is, it would be some sort of solidarity based travel system where good revolutionaries would be able to travel. You know, just as only chavistas seemed to have access to Copa America tickets. But I digress. Conviasa started flying to Margarita, not necessarily the most affordable destination for "popular" strata even though definitely a popular destination for its cheap booth and sundries. So we can assume safely that the first beneficiaries of Conviasa were public servants out on a shopping spree to Margarita Island. But of course, with the help of a few petrodollars and a the possibility to travel strictly among chavista far from the prying eyes of indiscreet opposition the airline kept growing. And now Conviasa is even emitting a frequent flier card. In fact TWO of them, a gold and a silver, because you know, some revolutionaries are more equal than others. The ad comes with everything, even the red revolutionary star (also on the web page of the airline). 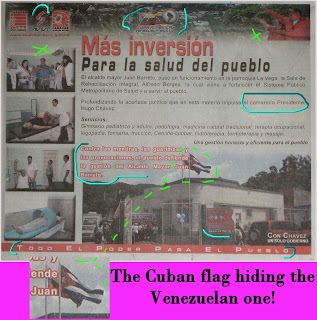 It also carries the words "privileges", "advantages", and tucked at the bottom left, "the people", the one that is supposed to rule through Chavez (click to enlarge). PS: do they get pasta for lunch on flight? Let them eat Corn Flakes! As I predicted on June 11, eventually we run pout of pasta. 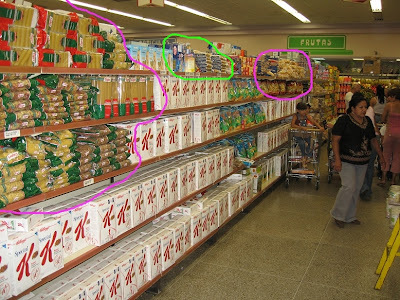 This is the pasta shelf at the San Felipe Central Madeirense on Friday 13 (!) July 2007. One year ago the whole shelf except for the two extremes (bread and instant soup, about 25% of the total shelf space) was filled up with at least ten brands of pasta, all sorts of variety and more often than not with stacks of pasta on the hallway itself, making difficult the shopping cart circulation. Well, today the Central offers you a nice protein, dietetic option of Corn Flakes. Three, 3, types of flakes actually!!!! So you can have one in the morning, another one at lunch and the last one for dinner. For those who do not know, after the Italian immigration of the 40ies and 50ies pasta has become a main staple in Venezuelan diet. To the point of creating some weird cuisine. For example Yaracuy is known for having invented the not very dietetic pasta and beans dish. I suppose that Yaracuy, a rather poor state, invented this combination to compensate for a low meat protein diet. Now it is a local specialty (also found in Lara, by the way). Oh! but there are good news!!!! Mayonnaise is back, sort of. Now we can find on, ONE, brand of cooking oil at least once a week. But forget about fresh milk and white sugar or beef and chicken. Unless you re at the store opening for the later. I think that from now on I will always bring with me my camera to the grocery store, though I doubt very much that Nazional guards at Mercal will let me take pictures. Tal Cual carried a very interesting article that speaks volume about the increasing decrepitude of the Venezuelan economy, a decrepitude hidden very well by a sea of oil dollars that pay from frozen chickens to shinny Hummers. The graph below plots the evolution of trade between the Andean Countries and Venezuela. It is to be noted before examining the graph that Chavez has decided to favor Brazil trade above Andean Community trade (the AC is formed by Colombia, Peru, Ecuador, and Bolivia since Venezuela left). Yet, the graph tells us quite a story about an economic reality that chavismo refuses to face. The first thing we can observe is that when Venezuela had a "normal" economy the trade amounts moved about with the same tendency. Then, when chavismo started its march to "socialism" and when the price of oil allowed Chavez to wave his check book as he pleased, the trends broke as the Venezuela green line was left far behind. Why? First, until the year 2000 Venezuela was able to sell a little bit more than oil to its Andean partners. And even though importations were significant Venezuela tended to have a trade surplus. But since 2000 Venezuelan exports started falling and the reprise we see in 2004 is due to the increase of oil prices, and hence the increase in oil derivatives. The article states clearly that Venezuela only exports oil derivatives and some steel to its ex Andean partners. The other exportations have all dried up due to the currency exchange control in place since January 2003. Venezuelan products have stopped being competitive: the government forces folks to export at the official rate and thus a currency overvalued by about 80% kills exports value. By the same token it is a boon for importers who can buy in Colombia stuff cheaper than what is produced in Venezuela. This is particularly favorable to Colombia which shares an extensive border with us. As Venezuela agricultural production fails consistently to meet internal demand, when not decreasing its actual production, Colombians just need to send a few trucks across the International Bridge at Cucuta. The trade deficit became a gap as early as 2005 and in 2006 it was downright worrying, if anything by the dramatic trend. With Brazil we cannot talk of trade gap, but rather of one way trade. Even Brazilians worry about their trade surplus with Venezuela as a few moths ago Lula worried aloud. Today El Universal reminds us that while it also comments that non oil exports in Venezuela have dropped from in 7,127 billion USD in 2005 to 5, 245 in 2006. There is no relief in sight. In fact this totally uncontrollable gap has forced Chavez to admit that he might reconsider the decision to leave the AC. The structural cause of the gap are not addressed by the government. 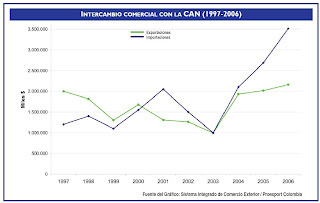 The increasing imports of food stuff (creating even some problems in Colombia) are due to an increased purchasing power of the population which is good, I suppose, if we make abstraction that this increased purchasing power does not come form the work and production of the people but from the oil buried under our feet. That increased purchasing power is unfortunately combined with negative pressures on the agricultural sector. The politics of land grabbing have stopped private investment in the country side while the new cooperatives seem to be overall an unmitigated disaster as they produce at best enough for their survival. These new "social production" joints fail to offer any significant surplus that can be commercialized in the rest of the country. And the government has only itself to blame for that since many of this land grabs are coming at the expense of fully producing private concerns while the peasants brought in are pretty much left on their own not receiving all the help promised by the administration. The first results are now in: Venezuela will have for a long time a chronic shortage of beef and dairy as the specialized cattle is simply not replaced. Beef we can import for the time being but milk is already in rather short supply in foreign markets. We can see that on our grocery store shelves everyday now. The worst part is that the government keeps its policy of seizing cattle grazing ranches while any effort at resettling seized areas seem to be failing. From chronic shortage we risk to move on to permanent scarcity. Soon, considering that the government is keeping up and even strengthening its policy to fix prices so as to control inflation we are faced with the risk that Colombia will refuse to keep exporting cattle unless paid cash by Mercal at prices well above the Venezuelan regulations. How long the government will be able to keep up a straight face on this is anyone's guess, but the long term damage is already done: Venezuela is probably now a decade away from self sufficiency in meat and milk, even if the correct polices were to be implemented today. Sugar is also another chronic laggard on the shelf. White sugar has disappeared since last year and brown sugar seems not to be as frequent as it used to be even one month ago. Again, price control and land grab are to be blamed for it. And again, as ethanol production keeps going up in the world supplies of comestible sugar might decrease some and their price increase. Another item with which the government is going to find difficulties in pretending that things are fine. Other items are also in trouble but not as bad as the ones above, thus no need to discuss yet the problems in chicken production, for example. Beans, on the other hand........ But the point is made: the policies of the Chavez administration have created a dependency on imports that favors even countries with which Chavez does not want to have any deal with like Colombia. Imports from Colombia are at the sufferance of Chavez as he cannot simply replace them with imports from somewhere else. And there is no sign that in the near future Venezuela will be able to reduce its dependency with Colombia, by very far the largest share of the AC trade. Right now, astoundingly, Venezuela imported from Colombia in 2006 3,125 while its exports to Colombia dropped to 631. For every dollar Venezuela sends to Colombia it buys back 5 dollars. How long can this last?